Trainer Mark Kavanagh knows that he has the right three year old in Super Cool to win the Group 1 $1.5m AAMI Victoria Derby (2500m) at Flemington but is not getting over excited until start time on Saturday. 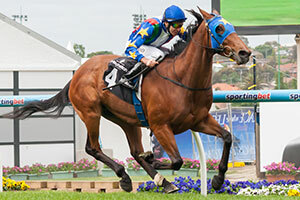 Super Cool came into Derby calculations with an upset win over Kiwi It’s A Dundeel in the Group 2 $220,000 Mitchelton Wines Vase (2040m) at Moonee Valley last Saturday. But Kavanagh has faced disappointment before with Whobegotyou being beaten as a short priced favourite in the 2008 Victoria Derby going down to 100-1 chance Rebel Raider and then the following year his Derby fancy Shamoiline Warrior had to be withdrawn on race morning. “I’ve had Whobegotyou beaten as an odds-on favourite and then three years ago Shamoline Warrior was favourite but scratched on the morning of the race,” Kavanagh said. Kavanagh thinks Super Cool is the real deal and will have no trouble running out the 2500m of the Derby on Saturday even though he is by sprinting sire Fastnet Rock and was strong at the end of the 2040m when he beat It’s A Dundeel. “The further they have gone, the better he’s run,” Kavanagh said. Kavanagh went on to say that his unbeaten Group 1 winning mare Atlantic Jewel, also by Fastnet Rock and did get better as he stepped her up in distance. Atlantic Jewel was untouched to win by seven lengths in last year’s Group 2 $300,000 Wakeful Stakes (2000m) at Flemington but had to miss a run in the Group 1 $1m Crown Oaks over 2500m because of injury after being the overwhelming favourite. “With Atlantic Jewel, every time I stepped her up in distance, the further she would win by,” Kavanagh said. New Zealand trainer Murray Baker said that It’s A Dundeel will bounce back at Flemington after suffering his first defeat at Moonee Valley. “He just raced a little dour,” Baker said. Jockey James McDonald agreed with Baker and is looking forward to getting to the bigger spaces of Flemington. “He’s a big track horse,” McDonald said. “He was almost beaten at Canterbury, almost beaten at Wyong and he’s won really well on two big tracks.